The deficit is the amount of money we spent, but didn't have, for the country, for the year. The debt is the total amount of money we owe, which, by definition, is the sum of all deficits. Basically, the deficit is 1 year of debt. 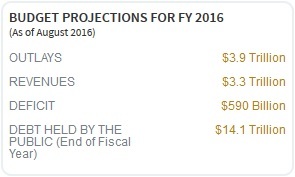 OK, so the deficit is .59 Trillion. The debt held by the public, is lower than the total debt, because some of it doesn't count. They only borrowed it from social security, which has no hope of ever paying it back. Debt held by the public 9-30-16 was 14.17 trillion. So the actual deficit is 1.11 trillion. Then if you look at the total debt outstanding, which is the number you usually hear about, you get 1.4 trillion and about 19.6 trillion outstanding debt.